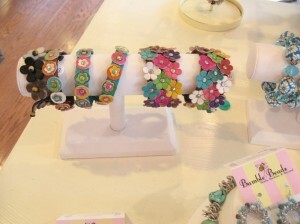 J went to a birthday party today at Bumble Beads in Latham. I hadn’t ever been inside, although I’d peered in one day when we were visiting Hoffman’s Playland, which is right next door. The mom provided snacks, pizza, & dessert. 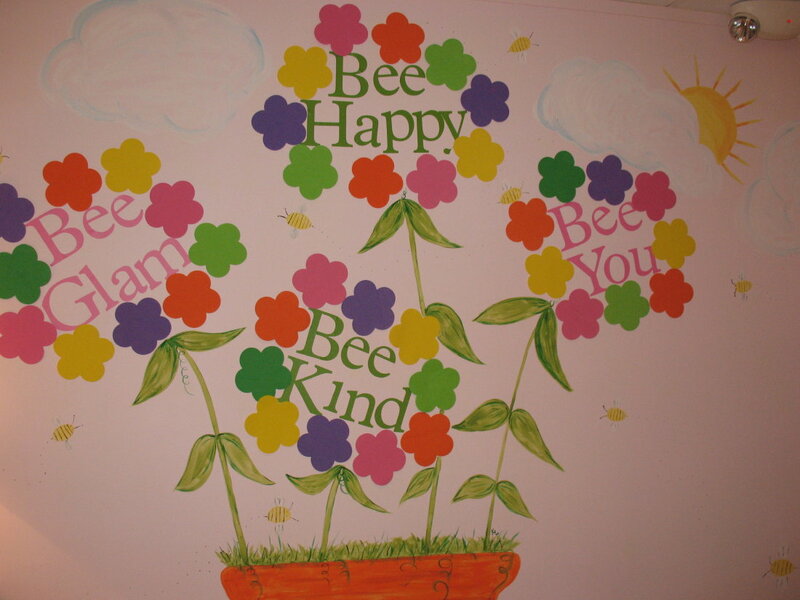 The store provided the space (a little alcove portion of the store), two crafts per child, and a teensy goody bag with a candy necklace, a honey stick (because of their bee theme), and a coupon. They also had tiaras and fairy wings available to wear during the party. The party was 1 1/2 hours. 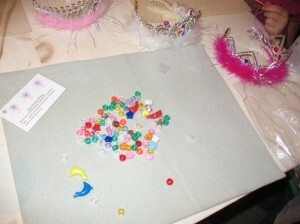 Here was a good idea: they had little felt fabric place mats for each girl to keep the beads from rolling. I will so use this technique in the future. The crafts themselves were a little blah. Both were items that you could have done just as easily by buying basic supplies at the craft store. I know that the kids were 5- and 6-year-olds, but I want it to be extra messy to do and/or look extra fancy at the end if I’m going to a crafty destination. Of course, that’s me. I know that some people will pay significant money just to keep the party out of their own home. 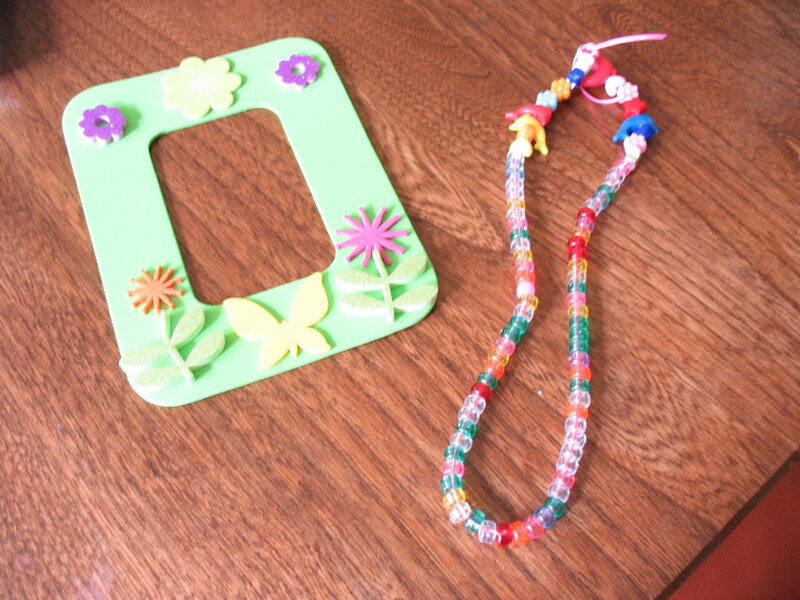 I’m also a little bit freakishly sensitive about the girl party thing: this idea that little girls want to sit quietly and make themselves beautiful and/or create accessories so that they can be more beautiful. Yeah, I know that they like it. And I’m okay with that. 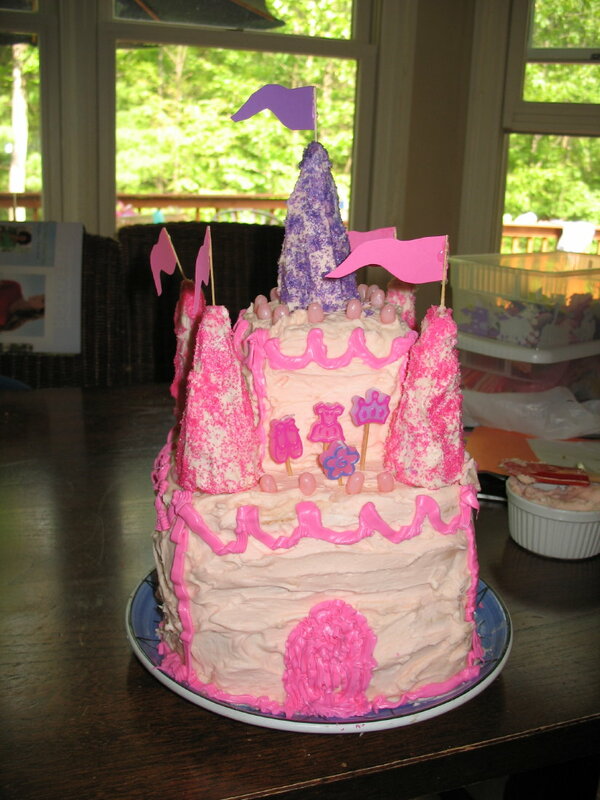 I mean, I made that princess castle cake, right? But I just don’t like to completely pigeonhole them quite so much. I want them to be able to run around and laugh and shout, and the space just wasn’t there for the wild abandon that makes a great party. In fact, there was a hopscotch design on the floor, and J kept on getting up and doing hopscotch. At one point a few of the girls started to run in a little circle, and they got pulled back into the quiet activity. There was plenty of giggling, though. And the birthday girl is currently nutty about jewelry, so it was absolutely perfect for her. I think that this would be a terrific destination for an older girls’ party, when they’re at the age when they might just want to hang out and chat and do an absorbing project. 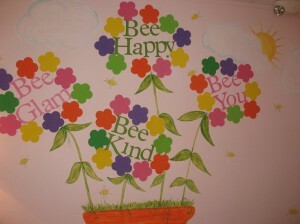 Or even a moms’ night out: they do grown-up crafts. There was a tremendously enthusiastic customer buying items who had come back after going to a class for the first time last night: looks like she’s got a new obsession. I thought that the party prices (they’re on the website) were expensive, but the items in the shop were priced well. You know I’m not a shopper, but there were plenty of nice things for the moms to examine during the party. 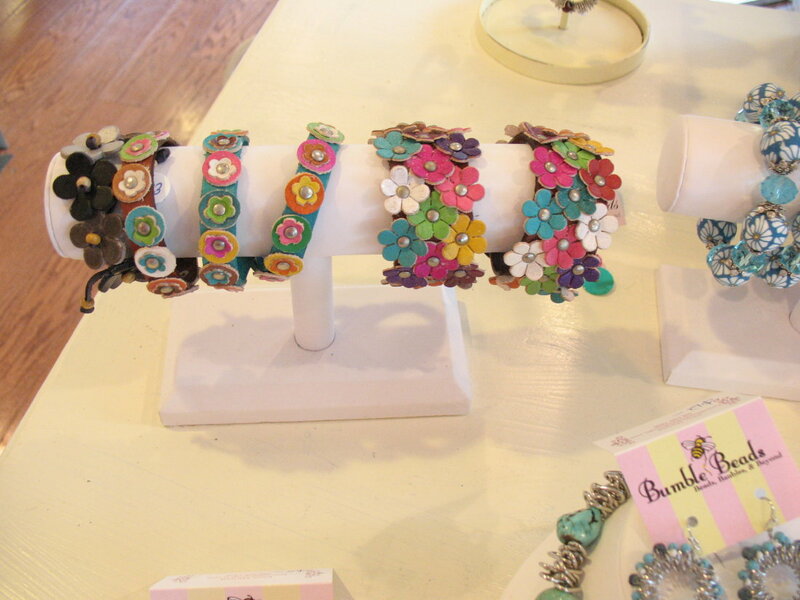 I barely managed to suppress my desire to buy one of the thin turquoise bracelets for M–it’s just exactly her style. But I’d already completed her birthday shopping. In fact, now I’m a little bummed that I didn’t go ahead and buy it and store it for some future occasion: she saw the picture and liked it, just as I predicted. There were cute gifts. I also wanted a mood ring for myself. I’m a sucker for a mood ring, probably because I’m naturally a warm-fingered gal. So mood rings always tell me that I’m happy & relaxed, and then I’m convinced. Come to think of it, I’m the same way about most things like that: I only “believe” in horoscopes and fortune cookies when they tell me that everything’s going to be great. One scheduling note: tomorrow’s 9:45 am hike listed on my weekly events post has been canceled.